Airtel subscribers will be able to access high speed internet at these 500 locations free of cost. Every subscriber with the subscription to unlimited combo plan will get 10GB worth of data for Airtel Wi-Fi Zone. We have already received word that all the telecom operators combined will be vying to deploy over one million Wi-Fi hotspots across India. Some of the telecom operators seem to be having a headstart in this regard as they have already established an impressive Wi-Fi footprint in the country. Airtel is calling its Wi-Fi hotspot service as Airtel Wi-Fi Zone and subscribers of the telco will be able to access the internet at these Wi-Fi Zones in case they need access to high-speed internet in public places. What’s impressive is that Airtel has already deployed these Wi-Fi hotspots across 500 locations, and has also detailed a list of locations where the Wi-Fi Zones are present. Here are more details about Airtel Wi-Fi Zones. The new Airtel WiFi Zone will be available in public places like Airports, Colleges, Hospitals, Corporate Parks, Retail shops and more. However, it is worth noting that currently Airtel is allowing its prepaid subscribers to connect their phones in the Wi-Fi Zone and the service is presently unavailable for postpaid subscribers. 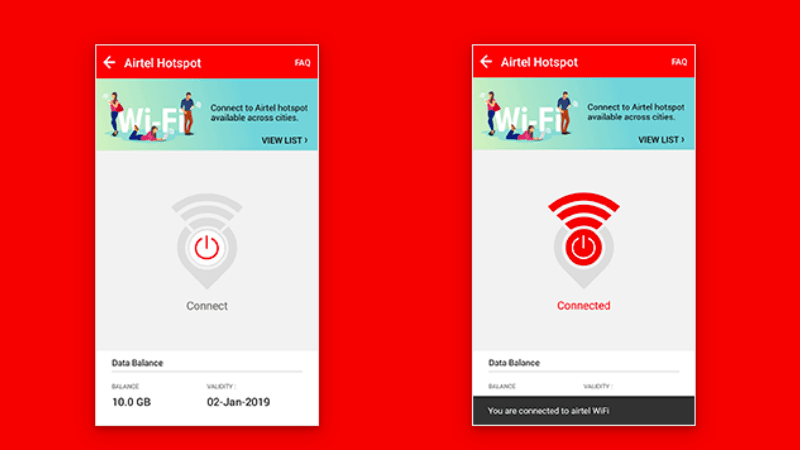 In case you’re in an Airtel WiFi Zone, you can easily use the My Airtel app to connect to the Wi-Fi by tapping on the “My Wi-Fi” tile in your My Airtel application. After accepting permission, you will be able to browse the internet. Alternatively, you can also establish a connection via OTP and signing in to the Wi-Fi network by connecting to the open SSID named @Free Airtel Wi-Fi. On the sign in page, you can tap the “Airtel User” button to proceed with the OTP verification process. The advantage of connecting to Airtel WiFi Zone via My Airtel app will be that; you get an easy way to keep a check on your balance data. Airtel has also noted on its website, that once you run out of this quota, you will have to disconnect the Wi-Fi and resume using your mobile data for further internet usage. In case you would like to try out the Airtel WiFi Zone service, you can head over to the Airtel official website and navigate to the “Check Wi-Fi location” tab, type in your city and location to see whether you have nearby access to the Airtel WiFi Zone. Speaking of the data allowance which every customer is getting as part of this new Airtel offering, the telco has announced that every subscriber with the subscription to unlimited combo plan will get the 10GB worth of data credited to their account for use in Airtel WiFi Zone. Like we mentioned above, Airtel subscribers will be able to check the leftover data from their My Airtel app or Airtel Self Care website. Having said that, the data benefit will differ with the prepaid plan you recharge. Airtel’s unlimited combo plans ship with 10GB free Wi-Fi data for usage with a pre-fixed validity period and the validity of the Wi-Fi data will differ compared to your prepaid plan’s validity. Right now, Airtel WiFi Zone service is available across various parts of Delhi, Karnataka, Pune, Hyderabad locations. Their technical team is totally out of sync with their marketing team. From the top there is so much pressure on everyone within their organisation to increase revenue while curbing costs that they come up with such unviable, unmaintainable plans without checking technical feasibility. I have 7 AirTel sims, all prepaid. Inconsistently, their app shows WiFi data of 5 GB on some of them only. Also nowhere is there any info regarding the location of their wi-fi coverage. So, effectively, these “GB” are useless to me. Hangouts didn’t work for me either.